LTC/USD is under pressure, in sync with other coins. Charlie Lee claims that Bancor is not truly decentralized. Litecoin touched $78.00 during early Asian hours before recovering to $78.88. Litecoin’s is the sixth largest coin with the market capitalization of $4.5B and with average trading volume at $198M. The coin is down 2% since the start of the day amid global cryptocurrency sell-off. Litecoin price is moving in tandem with Bitcoin and other digital assets, which means that more downside may be in store. The crypto market feels the pain following the news about a security breach on Bancor, decentralized cryptocurrency exchange. “A Bancor wallet got hacked, and that wallet has the ability to steal coins out of their own smart contracts. An exchange is not decentralized if it can lose customer funds OR if it can freeze customer funds. Bancor can do BOTH. It’s a false sense of decentralization,” Charlie Lee commented in his Twitter account. This case might be yet another evidence that the existing ecosystem of digital assets is not as safe and secure as we might want it to be. 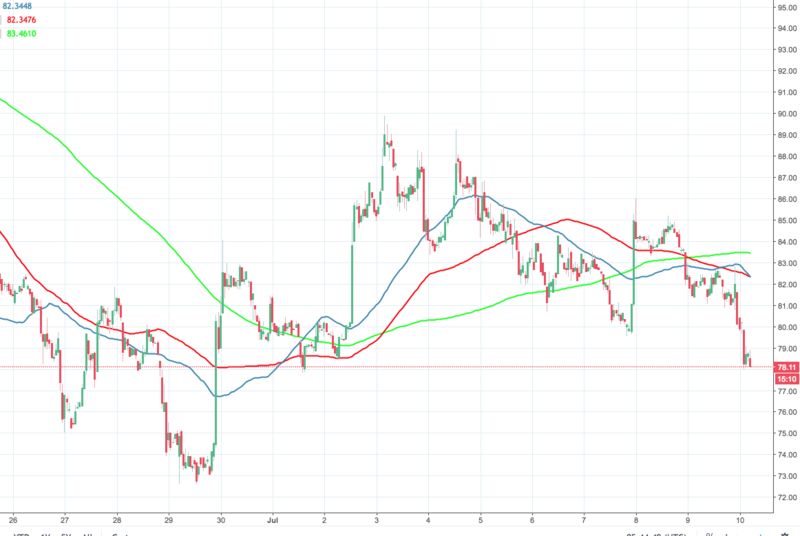 Litecoin is trading below all intraday moving averages (1-hour chart), which worsens the technical picture. The price needs to break above $82.00 and clear $82.34 (50-SMA and 100-SMA, 1-hour chart) to get a chance for an extended recovery. On the downside, a sustainable movement below $78 .00 will pave the way towards $86.00 and to $73.30 (the lowest level since June 29).